The intersection of 67th Avenue and 110th Street, in front of Forest Hills High School, will be renamed The Ramones Way. QUEENS — It really is Rock 'n' Roll High School for the Ramones. The legendary quartet from Forest Hills will soon have a street named after them directly in front of the high school they all attended. 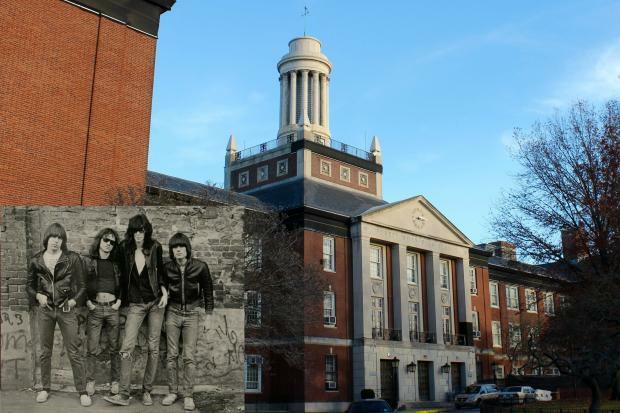 The intersection of 67th Avenue and 110th Street, where Forest Hills High School is located, will soon be co-named “The Ramones Way,” after the City Council approved a proposal to rename 65 streets throughout the city Thursday, according to Councilwoman Karen Koslowitz’s office. Mayor Bill de Blasio has yet to sign the bill. The original band members — Jeffrey Hyman (Joey), Thomas Erdelyi (Tommy), Douglas Colvin (Dee Dee), and John Cummings (Johnny) — all grew up in the neighborhood and met at Forest Hills High School. The bandmates had their favorite hangouts throughout the neighborhood, like the Thorneycroft Ramp, a path leading to the rooftop of a garage at the Thorneycroft Apartment complex on 66th Avenue, near 99th Street. At some point, some of them also lived in the basement of Joey’s mother's art gallery on Yellowstone Boulevard. Last month, two murals were painted in Forest Hills to honor the band's roots. The second mural was painted on the wall under the 71st Avenue Long Island Rail Road overpass, near the Station Square area. Koslowitz’s office said that the date for the official co-naming event has not yet been decided, and it will be later coordinated with Mickey Leigh, the brother of Joey Ramone, who is expected to participate in the ceremony.